It has long been recognised that sports injuries, and particularly those resulting from contact sports such as boxing and rugby, have the potential to cause long term cognitive consequences when injuries involve the athlete’s head. The term cognition refers to our mental capacities, and includes a wide range of abilities such as sustaining one’s attention for a period of time, remembering events from the past, being able to organise one’s behaviour, act rationally and make sound decisions. As part of the assessment and treatment process following a sports-related head injury, neuropsychologists are responsible for identifying acute and chronic cognitive and emotional sequelae that an athlete may be presenting with or at risk of post-injury. The importance of neuropsychological assessments has gained much credit, as a growing body of literature exists detailing the possible long term consequences of multiple head injuries, and in particular, the increased risk of developing a neurodegenerative disease later in life. A large proportion of what we know about sports related cognitive presentations comes from the study of boxers. Amongst boxing communities, sports commentators and the lay public, several terms were developed and used to describe the characteristic behavioural and cognitive abnormalities displayed by boxers. These included “punch drunk” and “slug nutty”. By the 1970’s, evidence from studies examining brains of boxers’ posthumously confirmed that chronic head trauma, such as that experienced by boxers and other contact sport athletes, may lead to the development of a unique neurodegenerative condition that presents similarly but is distinct from other dementias such as that seen in patients with Alzheimer’s disease and Parkinson’s disease. Initially termed dementia pugilistica, the condition is now widely known as chronic traumatic encephalopathy (CTE). CTE is the most severe form of damage across a continuum of conditions associated with sports injuries. This blog post will briefly examine the three primary manifestations of sports-related injuries, namely concussions, post-concussion syndrome and CTE. Concussions are typically defined as an alteration in mental status that is induced by trauma to the head. Using boxers as an example, a blow to the head or face results in an acceleration or rotational force that is transmitted to the brain. An alteration in mental status may occur, either with loss of consciousness or without, although the loss of consciousness must not exceed 20 minutes to be considered a concussion. Concussions are regarded as a mild form of head injury and often present with headache, dizziness, double vision, nausea and weakness. Of interest to neuropsychologists are the acute cognitive deficits, which include slowed information processing, poor attention, poor reasoning skills/decision making, memory loss and visuo-spatial deficits. Importantly, the physical and cognitive consequences associated with concussions are short lived. In some cases, the physical and cognitive symptoms associated with a concussion do not rapidly resolve. The term post-concussion syndrome was developed to describe a persistent groggy state experienced by some athletes following a concussion. While symptoms most often persist for several weeks, they can occur for months or up to a year. The most common physical symptoms are headache and dizziness, while the cognitive symptoms are those described under concussions. Post-concussion syndrome has been identified as a risk factor for later development of neurodegenerative disorders. CTE is a neurodegenerative disorder which has been noted in athletes who have sustained chronic cerebral trauma. The symptoms typically become evident years after the individual has stopped engaging in the sport/activity and manifests as mild confusion, ataxia (lack of voluntary muscle co-ordination) and features associated with Parkinson’s disease such as tremors, rigidity and motor slowing. As the disease progresses, changes in cognition become more evident and are characterised by poor memory, attention, processing speed and executive functions such as decision making, planning, organising and prioritising. Personality and behaviour changes also become evident and often take the form of impulsivity, rage/aggression, and childish or inappropriate behaviour. CTE is associated with several structural, chemical and pathological changes in the brain. The image above illustrates some of the structural changes evident post-mortem in a patient with CTE. 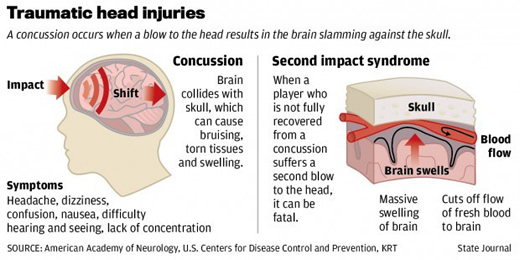 While typically associated with high impact contact sports such as rugby and boxing, concussions can occur in any sport, including individual sports. Surfing, skiing, and mountain biking for example all put athletes at risk of concussions because of the speed and “whip like” nature of their movements. While many possible cognitive consequences have been identified in athletes who have sustained head injuries, most researchers and clinicians agree that a single concussion has virtually no persisting impact on cognition or physical functioning beyond 5- 10 days, and in many cases, beyond 2 -3 days. The risk of more long term consequences, however, arises when an athlete returns to play before their concussion has fully resolved. This, unfortunately, occurs too frequently, as athletes report feeling fine and no longer experiencing dizziness etc, but may still be experiencing subtle cognitive changes. This is where neuropsychological assessments play an important role in concussion management. By conducting an assessment shortly after the injury, and then again when the athlete intends on returning to play, it can be determined whether any impairments noted in the first assessment have fully resolved. Concussion screening, however, is the gold standard approach and is recommended for all athletes who are involved in sports that have an inherent risk of head injuries. In such cases, it is extremely beneficial to conduct an assessment prior to experiencing any concussions or head injuries. By doing so, a record exists of the athletes cognition in their healthy state and can be used as a baseline should they sustain an injury later on. Concussion screening has become a standard procedure in many schools in the USA and is the most comprehensive way of reducing potential long term consequences. Keelie is a neuropsychology specialist at Neuropsych Consulting. You can check out their regular blog here. And for more info on their services and other work visit their website here. To get in touch with Keelie try info@neuropsychconsulting.co.za or phone her on 021 433 1721.